Enormous, impressive, Japanese map of the world. 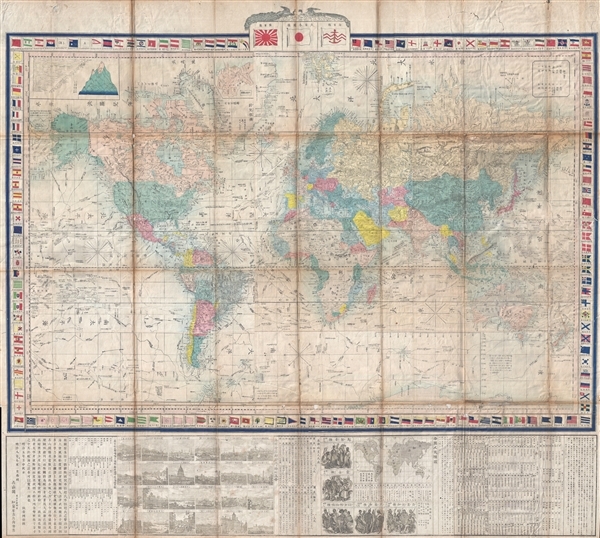 An impressive 1875 (Meiji 8) map of the world by Shu Oka. This finely engraved map covers the entire world on Mercator's Projection. The map identifies the routes of various explorers throughout with extensive annotation as well as inset city plans, historical and anthropological notes, comparative mountains and rivers charts, and ethnographic maps. The border is composed of the flags of various nations. Cartographically this is an updated version of Seiyo Sato's important map of 1862, which itself is derived from Dutch sources admitted to Japan via the open port of Yokohama. Published in Tokyo by Meizankaku. Good. Map exhibits wear and toning a fold intersections. Some fold intersections exhibit minor loss. Folds into original boards. Univ. of California Library, Berkeley, East Asian Library, A27.